Making space is the easy part, but what is paramount in a good people mover is whether or not it has the heart to haul all those people easily. Powering the Ertiga are two engines, a K-series 1.4 litre petrol and the one we have here, the tried and tested, multifarious, Fiat-sourced 1.3-litre DDiS turbo diesel unit. It’s the same engine that powers the Maruti SX4, Fiat Linea and the Tata Manza. While powering these sedans is one thing, carrying seven passengers with a fair bit of luggage is another. But Maruti have done well to tune the engine to suit the Ertiga’s characteristics. Though engine output remains similar to the SX4 and the Manza (Linea is slightly higher) at 90PS @ 4000 rpm and a maximum torque of 200Nm @ 1750 rpm, it’s the short gear ratios that make all the difference in the Ertiga. So what’s the performance in the real world like? Well, for starters we have turbo lag, not too much of it but it definitely makes its presence felt, however, once you’re above 2500 rpm, so does the turbo boost! While acceleration is decent, the midrange is where all the action is and the Ertiga never feels breathless here. Even with seven people on board, the motor does not feel restrained as long as you keep it in the powerband which is not really a difficult task. 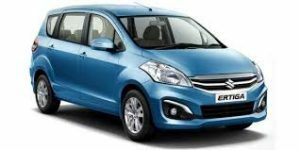 Uphills with a full load and air-conditioning on, however, does take a toll on the small capacity engine and frequent shifting is required to keep the Ertiga moving at a fair pace. Talking about numbers, the Ertiga lighted up its front tyres (yes, this one’s a front wheel drive) and launched its way to a 100km/h in 14.09 seconds which is mighty impressive for an 1800-plus kg vehicle. But it’s never about outright acceleration when it comes to MPVs. Slotting the gear lever in 3rd, this big momma did the 40-80 km/h stint in a scant 6.02 seconds. Considering our traffic conditions barely let you get into 4th or any other higher gears, the Ertiga can just laze around in 3rd all day. Just for the record, the Ertiga also managed a true top speed of 164 km/h, which means it can cruise at 120 km/h all day without breaking into a sweat. Retardation was pretty good too. Our test vehicle came with ABS with Brake Assist & EBD and did a great job when the anchors were dropped. Standing on the brakes at 60 km/h, the Ertiga managed to show zero on the speedo in 2.63 seconds over a distance of 21.86 metres and quite steadily, too, while from a 100, it took 3.81 seconds and all of 52.10 metres to come to a halt. This is a diesel dominated segment and Maruti officials say that they expect to sell 8 diesel variants of the Ertiga for every two petrol variants. This preference for diesel is going to persist as long as the differential exists, but this segment is just that much more sensitive to the costs and the savings. Maruti has just barely managed to launch a compact premium UV before the flood that is due to hit the roads in the next one or two years from competitors like Nissan, Hyundai, Toyota and Renault, and possibly even Mahindra & Mahindra – which is expected to launch a compact Xylo. Though a bit late coming from the car market leader, the Ertiga could still benefit from Maruti’s image of being a manufacturer of reliable, efficient and low-cost cars. So, though the target is the urban buyer looking for a family mover, sales could eventually come in quickly from institutional buyers too.